Elite Glass Services offers a wide range of stylish and uber-modern robe doors in order to suit different decor requirements. 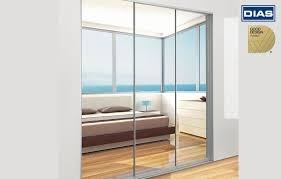 The different robe door options provided by us include sliding, mirrored, sliding, painted and vinyl and gyprock doors. If you are not sure about which one to choose, we can help you in selecting the most appropriate option, customise it according to your requirements and ensure an expert installation job. Go through the various types of robe doors provided by us given below. Mirrored robe doors are perfect to go with contemporary spaces as well as minimalist design trends where each and every feature plays an aesthetic role. Even if you have a classic, industrial, traditional, art deco or chic setting, our mirrored robe doors with anodised or powder coated aluminium frames would be more than ideal for it. They look incredibly amazing and perform excellently even after years of usage. The vinyl backed mirror helps to spread more light within a room and also creates the illusion of extra area. Sliding Mirror Robe Doors from Elite Glass Services provide a functional and refined solution, customised as per your requirements. Featuring slimline aluminium frames with corresponding narrow tracks that remain hidden within the frame and mirrors provided with a 4mm thick vinyl backing, they present a design suitable to be used as retractable dividers between rooms as well. By installing our sliding mirror robe door, you can be sure about having more space and creating a dramatic effect of additional area within your room. Available in 6 different colours – white, black, ivory, chrome, brushed silver and gold. Elite Glass Services provides a wide range of mirror and vinyl door options for buyers in Sunshine Coast. Change the appearance of your room by opting for our mirror or vinyl robe door. Manufactured with a highly reflective finish and vinyl backing, our mirror robe doors are capable of spreading the available light without taking up any floor space. On the other hand, our vinyl doors are made from top grade and extremely tough PVC vinyl, and also treated with antibacterial treatment for protection against mildew growth. Both the door types are very easy to clean and can last for a decade if cared for properly.